Our beautiful new vacation log cabin is perched atop a breathtaking hilltop surrounded by pink granite outcroppings, hundreds of native pine and fir tree saplings, and purple mountains majesty. The cabin is within a short 10-minute drive to the NE entrance of Yellowstone National Park and the popular Lamar Valley, known for its abundance of wildlife. It has the perfect vantage point for admiring the soaring mountain peaks and enjoying year-round outdoor activities, such as endless fishing and hiking. 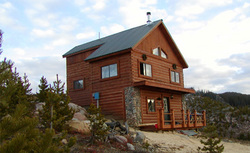 Hand-crafted locally, the cabin was completed in October, 2002. Specifically, it is located 3/4 mi. above Colter Pass, a stretch of Highway 212 named for the explorer and mountainman thought to be the first white man to enter Yellowstone, just three miles east of charming Cooke City. The small city is steeped in gold mining history and offers good dining and shopping during peak times in the summer fishing season and winter snowmobile season. For your comfort, the home has one queen sized aspen log bed in the master bedroom, two twin-sized beds in the sleeping loft, and one twin-sized bed in the downstairs TV room (with large VCR tape collection.) The cabin's kitchen is fully equipped and bedroom/ bathroom linens are brand new. Astronomy telescope provided for a night sky tour and binoculars provided (but not really needed) to take advantage of wildlife viewing from the front porch! Directions: This unique cabin is located on Sawmill Road at Colter Pass, 3/4 mile north of Highway 212 and 3 miles east of Cooke City. We are seven miles from the NE entrance to Yellowstone National Park. From Billings in the summer, it is a magnificent drive over the Beartooth Highway Scenic Byway. Use the Chief Joseph Scenic Highway from Cody. All year, Bozeman offers the easiest route through the north entrance of Yellowstone passing through Montana's Paradise Valley.